Wellcome to our new member from Finland, Rec Alkaline Oy. RecAlkaline Ltd from Nivala (FI) is planning entering Polish market very soon. 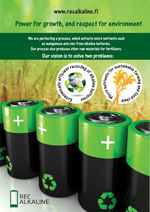 The company has developed alkaline battery recycling method which has the lowest energy consumption and the highest recycling rate in the market. The process produces no waste water or air pollution at all. In the process zinc and manganese are being extracted from the mass to micronutrient liquid. Rec Alkaline Ltd. together with Natural Resources Institute Finland has successfully researched possibilities to use this end product as nutrient source for plants cultivation. Cooperation has led to further product development of nutrient liquid used in plant cultivation. Rec Alkaline Ltd has started an investment for building a micronutrient fertilizer factory to Kärsämäki, Finland. This 2,5 Meur investment will be ready in 2017. Rec Alkaline’s recycling method enables environmentally friendly and energy efficient processing of collected alkaline batteries. Arable lands in our country suffer from a lack of manganese. Manganese participates in the plant, among other things, to the formation of protein, and its deficiency reduces nitrogen retention and plant photosynthesis, emasculates plant’s leaves and deteriorates roots growth. End product is a compound of manganese, zinc, potassium, sulphur and small concentrations of copper and iron.